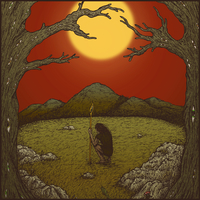 WITHERED FIST calls itself Stoner Doom band, but after listening to the band’s debut EP, its sure that there is more to the band than just that. So the Irish duet released their debut record earlier this year on January 1st independently, and it has just 3 songs but so much to offer. The EP starts with the title song in “This Is My Mountain”, which starts off in a slow melodic way, with clean vocals and clean guitar work, before the guitar work gets more sludgy and heavier. The drum work is mid-tempo and works just fine here. The unique riffs and the high pitch clean vocals of Carl King, brings unique sound, even though on paper it’s a tried and tested sound since decades. The riffs have PALLBEARER influence all over them, thick juicy and just the way, we Doom fans love them. All in all, 8:42 min song packs a lot, and honestly did not test my patience even after listening to it multiple times. “The Dread” starts with a mid-tempo Sludgy bass work, before bringing the thick riffs of guitars in. The song gets pacier with duel vocals singing the same lyrics, but the head banging doomy sludgy riffs not only are nostalgic, but offer a new take on the possibilities within the genre with clean vocals and unique abstract take on lyrical themes of love and pain. Again, the near 7 min song never tests your patience and makes it worth your time. The last and the longest song here “The Journey”, once again packs a lot of meaty juicy riffs from the start. But it’s the unique vocals here compared to the other 2 songs that makes this song unique here. Carl King sings along during the clean low tempo instrumental parts of the song and carries on a very melodic vibe to the song with his vocals, which didn’t exist in the previous songs. The low tempo bass instruments really bring out a unique side to what the genre as a whole can offer to the listener. The song did at times test my patience towards the end, but sticking on till the end made it so much more rewarding. “This Is My Mountain” could might as well work if it was just an instrumental album, but Carl King brings so much unique vocal perspective to the album that it elevates what is already a fine record. Fans of Doom, Stoner and Sludge, pick this one to taste new vibes this year.